"Savannah wanted to kiss him, but she had never even kissed a human guy before, let alone a ghost. How was she supposed to kiss him if he wasn't really there?" Savannah has never been in love before, but she's in love with Hunter Emmerton. He's cute, funny, charming...and a ghost. How can you date someone if nobody else can see them? Savannah had never been confident in herself before, but with her new-found powers, she discovers just how strong herself and her friends really are. But what Savannah didn't count on was falling in love with Hunter. She's never loved anyone the way she loves Hunter and she knows he loves her too. But how can they be together forever if he no longer exists and she's the only one who can see him? Will Savannah have enough belief in herself to defeat The Forces, or will they be able to lure her to the dark side and turn her against her loved ones...and tear her and Hunter apart? Savannah made her way across the dark hallway to her own room to get her flashlight out of her drawer. As she felt her way to the drawer, she heard a rattling noise coming from the other side of her room. She looked across the dark room, trying to see where the noise was coming from. Her bedroom window suddenly flung open, sending a gust of wind through the room and scattering Savannah’s homework papers all across the floor. “Great,” Savannah mumbled as she closed the window and picked the papers back up and put them on her bed. She went back over to her drawer to grab her flashlight and then headed downstairs to the kitchen. As she got to the end of the stairs, Savannah could hear the front door banging open and shut and the kitchen window rattling. Savannah knew she had locked the door after her parents had left. She ran over to the door to shut it, but it swung shut and locked itself before she got there. Savannah could feel her heart beating fast as she looked over at the kitchen window to see it slide shut and lock itself as well. She shone her flashlight around the room. There was no one there. A sense of fear came over her as she realized who was causing it. The woman at the lake had seen her with Hunter. The Forces knew who she was. Savannah ran over to the kitchen window to see if she could open it. It was stuck. All she could think about was how to get herself and Annabelle out of there before anything happened to them. The lights came back on and started flickering on and off around the house. Savannah placed her flashlight on the bench and closed her eyes, bracing herself for whatever was about to happen. She could feel a presence and hear a high pitched squealing around her. Suddenly, it stopped. Savannah opened her eyes. The lights had stopped flickering and the power was back on. She looked around the room. Everything was still and quiet. Too quiet, she thought. As Savannah reached out her hand to get her flashlight, the kitchen window flew open again, sending another gust of wind through the house. Hunter appeared beside her and knocked her out of the way just as the light above Savannah’s head exploded and smashed onto the floor, sending glass scattering where Savannah had just been standing. The two of them landed on the floor with Hunter shielding Savannah from the glass. “Savannah, what happened?” Annabelle yelled from upstairs after she heard the glass smash. “They know where I live, Hunter. My whole family is in danger, aren’t they?” Savannah asked him. “I have to see if Annabelle’s alright,” said Savannah. Hunter followed her upstairs to Annabelle’s room. When they got there, Annabelle was nowhere to be seen. Savannah could feel a sense of fear coming back. “Annabelle?” she yelled out as her eyes searched Annabelle’s room. “You thought I had what?” asked Annabelle. “Um, it’s…” Savannah looked at Hunter. Hunter grinned and disappeared. He reappeared with a glass of water in his hand and placed it on the bedside table behind Annabelle. Savannah reached over and grabbed the glass. “It’s here, Annabelle.” She looked over at Hunter again. “Thank you,” she whispered. Hunter winked at her and disappeared. Savannah smiled to herself. Their lives had come so close to being in danger that night, so why did she feel so happy? She looked down at Annabelle and stroked her hair. There was no way she was ever going to let anything happen to Annabelle. She cared about Annabelle more than anything. Savannah thought about what Hunter had said. He won’t let anything happen to her. There were four Chosen Ones to protect, so why was he always there for Savannah more than the others? Savannah smiled to herself again. Hunter was probably just doing his job by protecting her, but maybe he cared about her too. 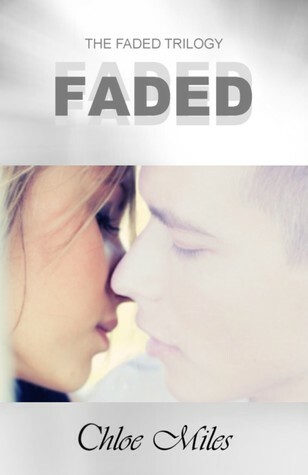 "Chloe Miles is the author of FADED, the first book in THE FADED TRILOGY. The second book in the series, SEE NO EVIL, is due to be released soon." Nice review, I liked this book!